This article is about the City of Weyburn. For the former provincial electoral district of Weyburn, see Weyburn (provincial electoral district). For the current electoral district of Weyburn-Big Muddy, see Weyburn-Big Muddy. For the former federal electoral district of Weyburn, see Weyburn (federal electoral district). Weyburn is the tenth-largest city in Saskatchewan, Canada. The city has a population of 10,870. It is on the Souris River 110 kilometres (68 mi) southeast of the provincial capital of Regina and is 70 km (43 mi) north from the North Dakota border in the United States. The name is reputedly a corruption of the Scottish "wee burn," referring to a small creek. The city is surrounded by the Rural Municipality of Weyburn No. 67. The Canadian Pacific Railway (CPR) reached the future site of Weyburn from Brandon, Manitoba in 1892 and the Soo Line from North Portal on the US border in 1893. A post office opened in 1895 and a land office in 1899 in anticipation of the land rush which soon ensued. In 1899, Knox Presbyterian Church was founded with its building constructed in 1906 in the high-pitched gable roof and arches, standing as a testimony to the faith and optimism in the Weyburn area. Weyburn was legally constituted a village in 1900, a town in 1903 and finally as a city in 1913. From 1910 until 1931 the Weyburn Security Bank was headquartered in the city. Weyburn had since become an important railroad town in Saskatchewan – the Pasqua branch of the Souris, Arcola, Weyburn, Regina CPR branch; Portal Section of the CPR / Soo Line; Moose Jaw, Weyburn, Shaunavon, Lethbridge CPR section; the Brandon, Marfield, Carlyle, Lampman, Radville, Willow Bunch section of the Canadian National Railway (CNR); and the Regina, Weyburn, Radville, Estevan, Northgate CNR section have all run through Weyburn. Weyburn was previously home to the Souris Valley Mental Health Hospital, which was closed as a health care facility and sold in 2006, and demolished in 2009. When the mental hospital opened in 1921, it was the largest building in the British Commonwealth and was considered to be on the cutting edge of experimental treatments for people with mental disabilities. The facility had a reputation of leading the way in therapeutic programming. At its peak, the facility was home to approximately 2,500 patients. The history of the facility is explored in the documentary Weyburn: An Archaeology of Madness. The city had a population of 10,484 in 2011, having increased from 9,433 in 2006. Weyburn is situated near the upper delta of the 470-mile (760 km) long Souris River. The Souris River continues southeast through North Dakota eventually meeting the Assiniboine River in Manitoba. In the 1800s this area was known as an extension of the Greater Yellow Grass Marsh. Extensive flood control programs have created reservoirs, parks and waterfowl centres along the Souris River. Between 1988 and 1995, the Rafferty-Alameda Project was constructed to alleviate spring flooding problems created by the Souris River. Weyburn has a humid continental climate (Köppen Dfb) typical of Southern Saskatchewan. 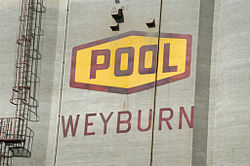 Weyburn is the largest inland grain gathering point in Canada. Well over half a million tons of grain pass through the Weyburn terminals each year. Oil and gas exploration make up the other major component of the economy. The Soo Line Historical Museum (c. 1910) is a Municipal Heritage Property under Saskatchewan's Heritage Property Act. Weyburn is also home to the world's first curling museum, the Turner Curling Museum. The public school system, South East Cornerstone School Division No. 209, operates the following schools. It also operated Weyburn Junior High School from 1966 to 2016, which was closed in favour of relocating students to Weyburn Comprehensive High School. The separate school system, Holy Family Roman Catholic Separate School Division No. 140, operates St. Michael School. Southeast College offers technical, trade and non-degree programs, as well as distance learning from the University of Regina and University of Saskatchewan. The Weyburn Public Library is a branch of the Southeast Regional Library system. The 90 foot water tower is one of only four of this type in Saskatchewan. It was in service from 1910 to 1977. 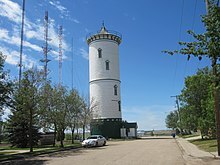 It stands on Signal Hill in Weyburn, which is still an important site for telecommunications towers and once had the tallest tower in Western Canada. Weyburn is at the junction of highways 13, 35 and 39. 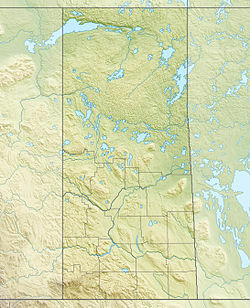 The Weyburn Airport is northeast of the city. Electricity is provided by SaskPower and natural gas is provided by SaskEnergy. The city maintains its own water treatment plant and waste management system. Telephone and internet services are provided by both SaskTel and Access Communications. The Weyburn General Hospital is operated by the SunCountry Health Region. The Weyburn Police Service and local RCMP detachment provide law enforcement for the city. Fire protection services are provided by the Weyburn Fire Department. Golden West Broadcasting operates three radio stations that serve Weyburn and the surrounding area; full service country station CFSL 1190 AM, hot adult contemporary station CKRC-FM 103.5, and mainstream rock station CHWY-FM 106.7. All three stations, and the cluster's news website Discover Weyburn, are based out of studios on 305 Souris Avenue in downtown Weyburn. Glacier Media Group publishes three newspapers for Weyburn and area: the Weyburn Review, Weyburn and Area Booster, and Weyburn This Week. Jackie Lind - Emmy Award-winning casting director. ^ Canada, Government of Canada, Statistics. "Census Profile, 2016 Census - Weyburn [Census agglomeration], Saskatchewan and Canada [Country]". www12.statcan.gc.ca. Retrieved 2017-08-14. ^ "Where 'Weyburn' the name originates". City of Weyburn. Retrieved 2010-11-10. ^ McLennon, David (2006). "Weyburn". Encyclopedia of Saskatchewan. Great Plains Research Center. Retrieved 2010-11-10. ^ "Weyburn Security Bank". Canada's Historic Places – a Federal Provincial and Territorial Collaboration. Retrieved 2012-04-14. ^ "About Radville". The Town of Radville, Saskatchewan. Radville Economic Development Committee. 2002–2004. Retrieved 2010-11-10. ^ Adamson, J (5 November 2003). "Canadian Maps: May 1948 Waghorn's Guide. Post Offices in Man. Sask. Alta. and West Ontario". Online Historical Map Digitization Project. Rootsweb. Retrieved 2008-04-15. ^ "Weyburn: An Archaeology of Madness". Internet Movie Database. Amazon.com. 2004. Retrieved 2010-11-10. ^ "2011 Community Profiles". 2011 Canadian Census. Statistics Canada. July 5, 2013. Retrieved 2012-04-14. ^ "2006 Community Profiles". 2006 Canadian Census. Statistics Canada. March 30, 2011. Retrieved 2011-07-16. ^ "Saskatchewan Road Map RV Travel Guide: #6 Canada / United States Border to Regina". Mile By Mile Media. 2007. Retrieved 2009-02-11. ^ "Canadian Rural Partnership — Rural Development – Public – Private Partnerships in Rural and Northern Canada Study – Appendix C – List of Projects". Government of Canada. 2005-09-26. Retrieved 2008-04-15. ^ "Water Control – Saskatchewan Dams and Reservoirs". Saskatchewan Watershed Authority. Retrieved 2008-04-15. ^ "Daily Data Report for January 2009". Canadian Climate Data. Environment Canada. Retrieved 16 July 2016. ^ "Daily Data Report for February 1996". Canadian Climate Data. Environment Canada. Retrieved 16 July 2016. ^ "Weyburn". Canadian Climate Data. Environment Canada. Retrieved 16 July 2016. ^ "Weyburn Airport". Canadian Climate Data. Environment Canada. Retrieved 16 July 2016. ^ "Weyburn... The Opportunity City!" (PDF). City of Weyburn. Retrieved 2010-11-10. ^ Soo Line Historical Museum. Canadian Register of Historic Places. Retrieved 22 October 2014. ^ "Turner Curling Museum". City of Weyburn. Retrieved 2010-11-10. ^ Greg Nikkel (June 1, 2016). "Farewell held for Weyburn Jr. High". Weyburn Review. Glacier Community Media. Retrieved November 15, 2016. ^ "Weyburn Public Library Branch". Southeast Regional Library. Retrieved 2010-11-10. ^ "Water Treatment Plant". City of Weyburn. Retrieved 2010-11-10. ^ "Refuse Collection and Disposal". City of Weyburn. Retrieved 2010-11-10. ^ "Weyburn General Hospital". SunCountry Health Region. Retrieved 2010-11-10. ^ "Weyburn Police Service". City of Weyburn. Retrieved 2010-11-10. ^ "Weyburn Fire Department". City of Weyburn. Retrieved 2010-11-10. ^ "Readerlink". Glacier Media Group. Retrieved 2010-11-10. ^ Kane, Laura (August 18, 2014). "Canadian Casting Director Jackie Lind Among Homegrown Talents Celebrating Emmy Wins". National Post.